Not for me, but not bad. If you like to swing your coil quick then stay away. Especially in trashy areas, CPU is slow. You need to slow down or you'll flat out miss targets. Locks on to silver like a hot dam. A lot of guys kill it with this machine but I never took to it the same way. Definitely not for a beginner. You need to be patient and slow down if your going to use it. I'd say if a very good machine but not for me. Great machine, but horrible customer service! Takes a miracle to get them to return calls or emails. CEO should be fired for allowing such a great product to fail in the customer service department. I don't care what anyone says bad about this detector. I have had all of them etrac always brings home the bacon, silver magnet. I have a Minelab Etrac. The machine while being a good performer is falling to bits before my eyes. The build quality is crap compared to other machines like Fisher/Whites/Garrett even Cscope have ten times better build quality. After the first hour with it, the beloved e-trac was nearly launched into the hedgerow. I tried many settings to what I thought was no avail. Then after about a month of trial and error, bingo, my brain realized what the e-trac was all about. The machine needs to be honed to the person using it. It is a very sensitive machine, but when fully tuned in to it's operator there is no better all rounder. Here are a few tips on how to perfect this machine (don't know too much how the soils differ worldwide to here in the uk), firstly, turn off your mobile phone, this will sporadically interfere with machine (especially iphones). Remove watches and jewelry on hands. Wear wellie boots (rubber) with no metal eyelets etc. Ensure your trousers (or pants) don't have metal poppers or zippers at the bottom. Carry your digging tool above waist height (I carry a shovel on my shoulder). All these common sense factors all contribute to the noise/sensitivity of the e-trac. I have found the machine when running a hot sensitivity (over 22) will pick-up on the slightest metallic objects or electrical item. All this, and that's without even starting on the settings. I will not go fully into what I run my settings at as it will be a personal preference. But what I will say is, if you are just starting out with the e-trac, set the machine for coins, a manual sensitivity of around 22 (drop it if unstable, add more if nice and quiet) and go for it. Don't bother with deep search, unless specifically looking for deep objects. You will end up digging bomb craters for old junk. That said, I like to run a nice low and quiet threshold hum constantly in the background. This will (in coin mode) tell you of any iron targets by going silent. If a coin is among iron contamination it will go silent then give you the lovely solid ring/beep. To run the machine on all metal with multi-tones is a test for the most hardened detectorist. You will end up looking constantly at the screen, when you should be taking in the scenery. Just remember this is a multi frequency machine so a slow swing and shuffle is best practice. I've dug targets at over 3ft deep, and on the same setting found bronze roman minim's in iron contaminated soil. Remember, this machine easily out performs the XP Deus on depth and range of targets.. The deus, is lighter and has cool wireless head-phones, but will be out done in the long-run... So persevere with this machine, you will be rewarded. A friend of mine suggested that I buy this machine based upon his experience over many years of hunting. 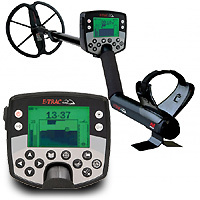 Years ago we both bought a Whites Eagle Spectrum and is still an awesome detector but the E-Trac once learning the sounds is a superior detector. Anybody that says it's not, either cant hear well or does not want to spend the time learning the sound. It does take a little practice. I think some people do not have the patience to learn what a solid tone is for what they are digging. There are cheaper and simpler machines that will find stuff but if you want a machine that will find the good stuff in areas previously hunted this is the detector for you. Bought the Etrac one year ago, within a month I found 1 golden coin and 2 silver hoards! One mediëval and one from the 1600's. No doubt, it's a silver killer. High tones on the silver, low tones on the gold. On the beach the best friend you can have (comparing to the Deus). This year I've found mediëval silver again, very edgy on little silver as well. I've uploaded several programs form the minelab site, the Roman site pattern is my favorite! Great balance also! One thing: for that amount of money I wanted a bluetooth headphone. The cord is lousy. And, you won't find golden chains (jewelry) with it, it will give a blur. It lives up to it's reputation. After owning 5 detectors from 3 manufacturers I can say it easily delivers the best results, and by a big margin. CTX has fancy features, but E-Trac is the go-to world silver killer for a reason. After considerable use, the ability to identify targets by their sound mid-swing will develop due the the fantastic tones scaling. Even with the stock coil you can perform coin pulls from trash other detectors can't touch. This comes with a downside. You won't want to dig things that E-trac doesn't agree with, and that is a no-no. If it's iffy, you need to dig it. I usually hunt in auto sensitivity, usually 19 on the scale. Manually turning it up to 25 does clean up ID clarity on deeper targets, but running it this way will be noisy. I have pulled silver quarters in the 9-10" range. Not saying it won't go deeper, it seems to on test gardens, that's just the deepest I've encountered them. While I'm still learning some of its fine details, I love this detector. On my very first day with it, I found a Spanish two reales and an Indian cent. It IS a bit noisy/chattery, but it's also great at picking out coins among junk. Once you get to know what the E-Trac's many sounds are really telling you, you will cut way down on the number of "junk targets" you end up digging. If you're thinking about an E-Trac, I would say to go for it. I know I won't be needing or wanting another detector for a long time.